for a retreat weekend of Machine Applique! Karen will share all of her tricks for sewing this 25" square block using her machine applique techniques. You will learn how to make smooth curves, sharp points, perfect circles and you'll also get to do some reverse applique. This block is stunning as a single block or you could make several more for a large wall quilt or bed quilt. 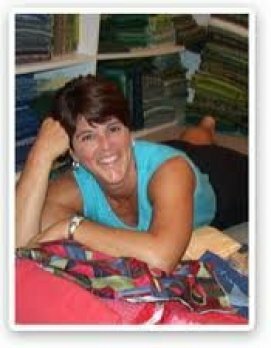 Karen has over 300 quilts to her credit, and her personal work has received numerous awards including NINE Best of Show awards, including the 2013 Best of Show at the American Quitler's Association Show in Paducah, Kentucky. She was voted teacher of the year by the PROFESSIONAL QUILTER MAGAZINE in 1997. Her work has been featured in numerous magazines and calendars. One of her quilts was chosen by Senator Wofford’s wife to be placed on display in the U. S. Capitol in 1992, and another was chosen for the same display in 1993. She has appeared on Simply Quilts and AQS show American Quilter. ~A 25" pattern and 11" pattern, interfacing, templar, brush, transfer paper and more!